Above photo: Kobe Trott leads the parade of kids with their adaptive bikes at Heinz Field. Photos by Stephanie Hacke. The 18-year-old, who has cerebral palsy, has never been able to ride a bike. But Variety — the Children’s Charity came to the rescue, giving him a set of wheels outfitted just for him and his needs. Kobe’s family, who live in New Castle, laugh that they’ll now have to keep tabs on him. Variety’s “My Bike” program gives kids freedom of mobility and the chance to enjoy riding with their friends. Kobe is one of 21 kids with disabilities who received individually customized adaptive bikes through Variety’s “My Bike” program this week. 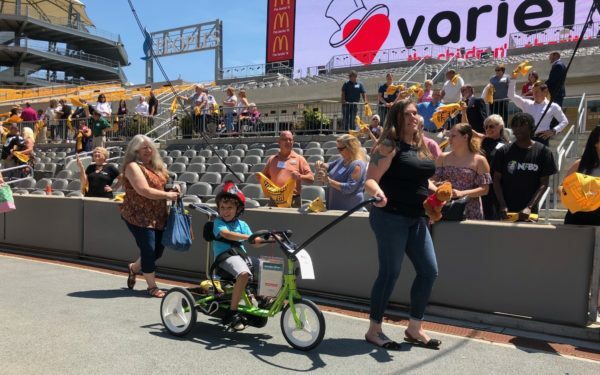 Each recipient had the chance to ride their bikes for the first time at Heinz Field in front of a crowd of cheering friends, family and Variety supporters. “I hope this turns out to be one of the most memorable events in these kids’ lives,” said Andrea Carelli, senior vice president of PNC and co-chair of the “My Bike” program, who hosted the event. The next time they’re sick or in the hospital, Carelli hopes the kids can think back to this moment and it makes them happy. Variety launched the “My Bike” program in November 2012. Since then, more than 2,500 adaptive bikes, strollers and communication devices have been sponsored for kids in the organization’s 54-county service area in Pennsylvania and West Virginia. 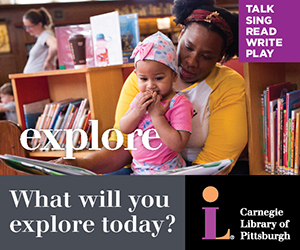 “What we’re doing in western Pennsylvania is creating a model,” said Variety CEO Charlie LaVallee. All it takes is creating awareness, finding the kids who have needs, finding the donors and bringing it all together, he said. Much of this “My Bike” giveaway was made possible through $500,000 raised by United Steelworkers International. Emma Rooney, 13, of Shaler, received her second bike from the program, having outgrown the first. She likes to ride with her twin sister Maggie. They ride on the side streets near their home. Emma even rode her bike at Open Streets Pittsburgh last year. Another bike recipient, Lachlan McConnell, 5, of Hermitage, just wants to be able to ride with his friends.